Why having a music technology class is important. One of the questions that I have struggled with from time to time during the 22 years that I have been in the classroom is Does what I am teaching in my classroom really matter? Or in other words, Am I making a difference in the lives of my students? Similar questions that both get to the heart of what I think many of us desire as teachers. We didn't get into this profession for fame and glory, or for the exorbitant salaries that we rake in, or for the long summer breaks (that are usually filled with planning and training for the upcoming year). I think the biggest desire in the heart of most teachers is that we want to make a difference in a student's life. To be a positive influence that helped a student discover their potential and to inspire them in some way to see and discover something in themselves that they couldn't see, but we knew was there. In the ebb and flow of a school year or across schools years, those questions don't enter my mind too often, but then there are other times that I am acutely aware and struggle to answer these questions in the affirmative. Recently I had two experiences with students that gave me great affirmation that what I am doing is REALLY important for students, and that music technology specifically has created some special opportunities for some who may not have otherwise had many positive experiences in school. I often will video my students as they are working on projects that have been assigned in class. Not long ago I made one of these videos. I moved around the class recording the students at work at their student work stations. There wasn't any particular reason that I started recording that day. They were all working, nobody was asking questions, so I just took out my phone and started recording. Later that evening I went back and watched the video and had an epiphany of sorts. The next day I shared it with a colleague of mine from another school. He watched the video of all of the students diligently working with their MIDI synths and DAWs and there was nothing of particular note at first glance. He responded by saying, "Oh, well that's cool. They're all working. You can hear the sounds of them tapping away at their keyboards, but so what?" I responded by saying, "In this classroom I have 2 of the top 3 academic students in their grade level, I have 2 students who are in small group, self contained classes all day with 6 to 8 other students because of their learning and behavior disabilities, and I have one student in this class that speaks very little english. Look at the video again and tell me if you can tell which is which." At that point he had the same epiphany that I had the night before. "Wow," he said, "They all look the same." Yes! They all looked the same! And that is the beauty of what my music technology class offers all students. No matter what their academic record is, no matter what their learning challenges are, music combined with technology had leveled the playing field so to speak. Every student was able to engage, discover and create at their own level. No struggling with language barriers, no struggle to keep up, no idle time waiting for the "slower kids" to catch up. The technology allowed each student to engage at their own level and go as deep as they were comfortable going in creating music. COOL!!! The second experience was with one specific student, I will call him Justin for the purpose of this article. The students that I have in my beginning music technology classes are randomly assigned to the class. The first couple of days of each semester, I start off in my classroom before moving into our lab. The first day is usually an orientation where I show a powerpoint with some video links explaining what music technology is. The second day is going over "house keeping" items of reviewing the syllabus, classroom and lab procedures and rules, etc. The first day of the new semester Justin walks into my classroom, chooses a desk in the middle of the front row, sits down and immediately puts his head down on his desk. I tried to engage him a few times, but decided to leave him alone on the first day. When the bell rang to dismiss class, he immediately sat up and walked out of the classroom. Sometimes kids are just having a bad day and I just let it go. On the second day, the exact same thing happened. He walks in, sits in the middle of the front row, head goes down, bell rings 45 minutes later, and he sits up and walks out of class. During my planning period I sat down and pulled up his student profile on my computer and I wasn't surprised by what I saw. He is failing every class, has quite a discipline record, an IEP, etc. My initial reaction was maybe I could use my extraordinary powers of elocution and persuasion to get through to him, but then again, no. since the day he first walked in. I have been going by and dropping little comments to him, but no response until that moment. So I walked over and say, "Hey. What's up?" He begins asking questions. Can you tell me again how to do this? Well what if I want to do that? How can I add this? BOOM! A breakthrough! Over the next two weeks, the students have completed two additional projects. Justin's grades on those projects were all A's. On each of those assignments, he not only is completing the projects but is going beyond the assignment, asking questions about how to add additional ideas about his creations. He walks into class with a "What's up Mr. J?" before sitting down and getting to work on something. In addition to the assignments in class, he is going home and getting on soundtrap to produce more music. Through this process I had said very little to try to "motivate" him into action. I simply introduced the tool and showed him how to use it. The music and the technology took over from there. And then I got the email. During my planning period I opened my email and saw one with the subject line: Schedule change. This isn't unusual. Typically its because a new student has moved in and they put them in my class, but not this one. I opened the email and Justin's name is at the top of the schedule change. They have dropped him from music tech to put him in a remedial math "enrichment" class. I literally almost cried. I won't go into all of the details, but I am working with his math enrichment teacher to get him some time in the lab. She uses music tech as a carrot to motivate him and I guess it works to an extent, but DAMN! This kid is finally engaged! I discovered that this kid is intelligent. He doesn't have a learning disability, there's just nothing in school that engages him. Justin speaks to me when I see him in the hallway and I encourage him to work hard in his other classes. He tells me that he is and that he is going to get back into my class. I believe him. Music technology is so important to so many students like and unlike Justin. The experience of being in the school band or orchestra or chorus is great for those students, but some kids just have no interest in playing an instrument or singing in a choir. Music tech opens the doors to musical creation and expression for those students. It gives them something to look forward to in the same way that the band, orchestra and choir rooms do for their music students. 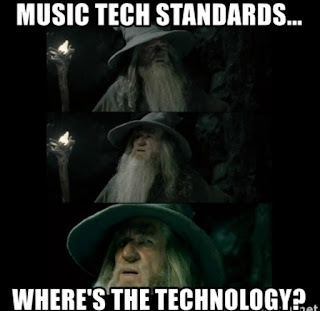 Word has gotten around and I now have students that I don't know coming up and asking how they can get into the music tech class. When music tech shows up on their schedule its like they won the "Connections Class" lottery, and in some ways I guess that's true. Am I making a difference in the lives of my students? With some help from music technology I am, and that makes me really happy.